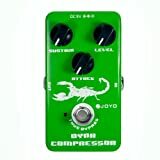 This sleek, durable, and efficient compressor pedal gets the job done. 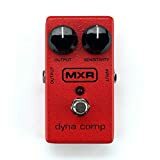 The MXR M102 Dyna Comp is an in-line compressor with output and sensitivity control. If you stable dynamics, this is your ticket. It comes a long way from being one of the compressor pedals for guitar and professional guitarists . And with good reason, it offers balanced and subtle tonal range. You should buy this for its incredible volume and sustain control. Also, for its smooth lead tones which is the true mark of the best compression pedal. 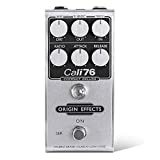 The Origin Effects Cali76 is small and powerful competitor available at a higher price than usual. It is a studio-grade guitar compressor pedal with excellent noise and sustain controls. The FET response is fast, effective, and has a much greater impact on your workstation that you’d expect. This is a good thing because professional guitarists need that sort of dynamic control over tonal range. We love how accurate this device is. It comes with flexible signal-conditioning controls and both an ultra-wide frequency response and ultra-high input impedance. A more affordable and classic pick, the JOYO JF-10 Dynamic is still powerful and durable. It features 3 control knobs on its main case: sustain, attack, and level. If you want complete control over your tones, this is your ticket. It offers low-noise and incredible sustain features. Plus, the true bypass feature helps minimize too much tonal squashing. As for its design, the JOYO looks premium, powerful, and compact. It’s best for studio-grade and professional-level performance. And it’s a good companion for guitarists who compose music on-the-go. A guitar compressor pedal is an essential apparatus that allows you to reduce the dynamic audio range signal of guitars. 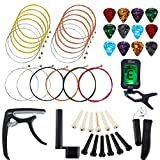 It’s also one of the best gifts for guitar players. To put things simply, the best guitar compressor pedal makes quiet sounds louder and loud sounds quieter. The primary purpose of this device is to ensure balance and uniformity in sound as quieter sounds can get softer and louder sounds harsh. Being a plucked instrument, guitars can emit a louder and sharper noise, so the need for a compressor pedal can enhance the overall quality of sound of a guitar. A wah pedal or ‘wah-wah’ pedal is used for electric guitar and for tweaking effects. Such an effects pedal has a direct impact on the guitar’s frequencies and tone. Once the signal enters the device, it is split into 2 copies: the first is sent to the device’s variable-gain amplifier and the second to a variable side-chain. Inside the variable side-chain, the signal copy is measured and with the circuit controlled, the final measured signal levels are applied to the amplifier. This mechanism of the guitar compression pedal is part of a system known as feed-forward type, which is used in most modern compressors on the market. But this isn’t the only kind of variable feed system used in compressors. For example, there’s a system known as vacuum tubes with its own advantages and disadvantages to look forward to. You can reap the benefits of a pedal in different ways such as in audio plug-ins, mixing consoles, and digital audio workstations. Also, you can also pair it with other versatile analog pedals such as the Earthquaker devices for the best results. dB, or decibel, determines the accurate measurement of the loudness of the audio range. The headroom is the dynamic range of the audio signal chain of the guitar. The headroom of your device would be the difference between the quietest and loudest sound the guitar can produce. The threshold is the level from where the compression device begins to influence the audio signal chain. Ratio is the measure of how much the compression device can reduce the volume of the audio signal chain above its threshold. The ratio plays a major role in influencing the guitar effects pedals. Attack is how soon the compression device kicks in after it reaches the right threshold. It is measured in milliseconds (ms). Release is how soon the compression device stops after the audio signal is right below the threshold. You can determine the correct release measure in milliseconds (ms). Soft knee is when the compression device influences the audio signal above the threshold. Hard knee is when the compression device is applied in full when the audio signal rises above the threshold. Once the audio signal emitted from the guitar increases in volume, traditionally above the standard volume level or the threshold, the compressor pedal will decrease the audio signal’s volume based on the ratio. Let’s assume that the ratio of the compression device is 5:1, so when the audio signal reaches 5dB – it is above the volume level or the threshold. The device will allow only 1dB of volume based on the ratio. In this manner, the total volume of the audio signal is reduced by 4dB. The same logic applies to all kinds of compressor pedals with varied ratios. For example, if the ratio is 30:1, it means for every 30dB sound, only 1dB will be emitted and heard that lies above the threshold. This concludes that the higher the certain volume or threshold, the higher the compressor pedal will reduce the audio signal’s volume at a certain level. The primary features you need to look for in a pedal is the threshold and the ratio. When you reduce the threshold of a compression pedal, it increases the volume more and more. Contrarily, if you increase the threshold of a compression pedal, it decreases the volume more and more. The former is when you pick the strings of the guitar softer and the latter is when you pick them harder. With an SP compressor, for example, you can blend in controls and adjust compression switch; such settings can be tweaked easily on an acoustic or a bass guitar. In conclusion, the ratio of the compression device allows you to control the amount of volume which is either increased or reduced above the threshold. So, the more you increase the ratio, the higher the guitar compressor will go to compress the audio signal. Another key aspect of a dynamic range compression device is make-up gain. It is what helps atone the decrease in volume when the pedal decreases the audio signal above the threshold. This drop-in in audio signal needs evenness and balance, which is what the make-up gain is for. It enhances the bass of the guitar too. You should know that a compression device is responsible for making louder parts of the guitar softer. It amplifies the sound as a result of the way the threshold interacts with other aspects of the device. There’s a significant difference between compressed and uncompressed audio signal. Plus, with a pedal there aren’t any harsh spikes in volume and as a result, the audio signal is more balanced and in-tune with the overall bass of the guitar. This is important because most people assume that a compression device increases softer sounds to louder volumes, but that is wrong. A compression device merely handles the variation in volume between softer and louder volumes of an audio signal. So, with compression, you will notice no spikes or harsh variations in guitar amp. 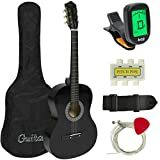 It reduces the difference between the quieter sounds with the louder parts of the guitar. When do you place your compressor pedal? Is it in the first position after your guitar or after the overdrive pedal or distortion pedal? The most popular choice is the former because distortion pedals do not help smoothen and even out the audio’s dynamic range. And that is needed for compression. On the other hand, placing the compressor pedal after the drive pedal results in balanced clean and drive sound. The correct placement of the best compressor pedal is an essential thing to consider. It plays a major role in how balanced and consistent your music turns out to be after production. A simple way to understand the placement is to think of it this way: the later you place the compressor pedal, the stronger the impact it will have on the final audio signal of the song. For example, with the Keeley compressor, with a 3-o’clock placement of the device, you get amazing solo tunes for acoustic performers. The MXR M102 Dyna Comp has VCA compression with 2 distinct parameters – output and sensitivity. It is powered by a 9-volt battery and a AC adapter for your convenience. This best volume pedal impressively colors the tone when engaged. It also adds a bit of noise, like a best bass compressor pedal does which is a good thing. This is the best option for the money as it offers a clean boost. The design is brighter and more appealing to have. It’s the ideal choice for professional musicians looking for hardwire bypass configuration and naturally extensive sustain. This is also best for acoustic guitar players. But for more vintage tones, go for the Xotic SP compressor. Moving forward, the MXR could make a reliable addition to your top-line compressors. Meanwhile, the control knob it comes with is intuitive and easy to use. It is one of the best bass compressor pedals on the market. It offers the best boost and level of control missing from most competitors falling under the same price. The Origin Effects Cali76 is an upgraded pick in performance and price. It is engineered using high-quality components and advanced technology. With studio-grade FET compressor, you get a low-noise and high-current pedal. You have separate controls such as release, attack, and ratio that allow you to precisely take control of your tone and sustain. The best feature is the jewel lamp function and its 3-color intuitive gain reduction meter. The DRY BLEND control allows you to combine various mixes parallelly to add tone and effect to your music. If you want much stronger dry and wet blend, go for the Keeley Plus series. You no longer have to strain to have exceptional tones by your side because this best compressor pedal gets the hard job done. It’s efficient, effective, and durable – all at a great value! What’s more? You get the practicality of transparent transient controls and beast-like sustain, all at once. Isn’t that what every professional musician wants in an expert compressor pedal? If you prefer something affordable, we recommend the JOYO JF-10 Dynamic. It’s the best compressor pedal to buy if you want to add effect to your music. With sustain, attack, and level knobs to control, the classic design of this device is worth considering. It’s designed for bass or output pickup which is best for thickening the tone of any audio signal. It even comes with a unique bypass feature that allows you to minimize tone less and noise. If we were to describe this pick in one word, that word would be effective and diligent. The bass settings give you plenty of room to explore, experiment, and create striking sounds. It has impressive sustain and volume customizations which channels across all frequencies, so you know what you want. Lastly, the controls feature exceptional headroom and dynamic range from start to finish – and all packed in a classic re-creation of durable build quality. Much like the Ibanez Tube Screamer known for its characteristic classic design. The Donner Compressor Pedal Ultimate Comp is the ultimate guitar effects pedal. It is a 9-volt compressor with both an input and output jack and an LED light indicator. This is one of the most responsive and intuitive compressor pedals on the market. The complete aluminium metal shell holds one normal and treble modals, a level knob, a tone knob, and a comp knob. Which means this pedal will last longer and stronger than most compressors on the market. And it’s of great value given its accurate audio signal processing features. We found that this best pedal does the job well and it’s a quiet one. It boasts of an easy initial setup and goes pretty far to offer transient sustain and volume normalization. It’s a smooth, balanced, and even compression device, with a tonal range similar to Xotic effects, from beginners to professionals. On an ending note, you’d also like its packaging as it comes as best as those classic conditioned pedals musicians adore! The Wampler Pedals Mini Ego is a class act for its smooth overtunes, soaring boost, and clean volume performance. It has three control options: blend, volume, and attack. And the true bypass which you can tweak to your standard in just a second. With dark and bright tone adjustments, you now have complete control over all aspects of compressing music. And this is precisely what a natural compressor pedal works and looks like. The Mini Ego is a scaled-down model of the Ego series, but scaled-down only in theory. In performance, this best compressor pedal is no less than powerful and extraordinary. You’d be impressed by its accuracy in decibel sound and clarity. Plus, it pushes the volume right up to a point where the pickup is just perfect! The bottom line is that this compression device is best for most people. 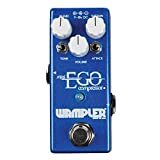 The Wampler Ego Compressor creates amazing sound, has the best control over volume and sustain, and looks rugged and sophisticated. The Electro-Harmonix Freeze Guitar Effects Pedal has an impressive power supply system and is best for capturing real-time sounds. We liked it because it functions as a unique and effective compressor pedal with 3 latch settings and endless effects. It’s best for influencing all your highs and lows effortlessly. So, you can experiment with newer sounds without having to compromise on noise or sustain or volume. With 3 latch modes, it allows you to transit between rich and full sound to a softer and more bleak sound. These modes include latch mode, guarantee liquid, and smooth tonal transitions. By the looks for it, This big muff is precisely what you need to move forward with. It has impressive tweak-abilities and is fun to use for producing new and exciting sounds with full guitar effects. Plus, it also features an effective level knob to maintain sustained volume as you like it! The TC Electronic HyperGravity Compressor is fit for flexibility. With 3 powerful performance modes, this best compressor pedal is sturdy, durable, and efficient. It comes with a built-in limiter that allows extra effect tones, which is a huge plus for most guitarists. This multiband compression device uses the same MD3 compression algorithm as higher-grade models. THis makes it one of the best compressor pedals on the market. The versatile modes this pedal offers is simply amazing. Plus, the control dial is easy to handle, especially when you’re playing live. This kind of control is the best kind to have for musicians playing live. It gives the best control and sustain and volume normalization. The bottom line is that the TC Electronic is the best compact floor package for most people. If you want a quiet and efficient pedal to move forward with, this should be your ideal companion. We found the Diamond Compressor Opto Comp to be the best compressor pedal for plenty of output. It comes with comp, EQ, and volume settings. The EQ settings allows better control and tonal possibilities, unlike many other compressor models. The sound reproduction on this model is smooth and subtle, similar to the professional Keeley Plus model. The audio signal won’t squash under too much compression, plus its infinite sustain has a lot exciting effects to offer, which is one of the best functions to have. On the plus side, this pick is of great value. It works well with both clean and drive sounds and if you keep it hooked with your EP booster, it definitely enhances your music to a whole new level. The tonal range of the Diamond Compressor bodes well with its classic and attractive design. With studio professional technology, it has great control and even better sustain than guitar compressors of the same price. The Mooer MCS2 Yellow runs smooth and balanced. It has classic and conditioned optical compression, which means it preserves the original sound quality and tones of the audio signal, giving you a more natural tone. Packed in a durable metal shell, this yellow beast is best for all kinds of sound reproduction. And when you need a small yet powerful compressor for your pedal board space, this is your ticket. The Mooer offers an impressive set of controls such as volume, EQ, and comp. We liked how dynamic and transient this compression device is. The minimal controls on this model works for most situations. Best for country musicians, the transparency on this pick is longer lasting and more accurate than ever. The only drawback to using the Mooer is that it lacks attack and release controls. But given the reasonable price and small design, it’s worth a shot! The Empress Effect Compressor Analog is the best competitor for its design, performance, and price. It’s a reasonable compressor pedal with an analog signal path and 3 compression ratio. By far, this is the best compressor chorus pedal which has attack and release control with incredible sustain. You get input, output, mix, release, and attack controls on the main frame. The bypass helps keep dynamic sound from squashing and sounding too compressed. The bypass of this impressive model reminded us of the upgraded Markbass Compressore, which is another powerful model with true bass compression. And the transparent compression gives you plenty of control for all your work. A similar option to this pick is our out-of-pick favorite, which is the SP compressor series. We liked the way the Empress Effects works. You can definitely go ahead with this choice if you want versatile “ratio” control along with flexibility in controlling attack and release. The triple compression ratios – that is 2:1, 4:1, and 10:1 – is easy to set up using the 3-way knob located on the main frame. It even has a 10 LED meter which shows the amount of input, gain, volume and reduction of the case. These are all features we think most guitarists would appreciate in a valuable and efficient compressor pedal. Is too much compression good or bad? While a compressor pedal can be a valuable tool for most musicians, it is often taken advantage of. This is when the audio signal is too compressed to a point where the music is cranked up to the highest possible level. When there’s a difference between the softer tones and the louder tones, it’s called a headroom. However, when the music is too compressed, there’s no headroom to begin with because everything is maxed out. Vinyl recordings of past music offer better headroom than MP3 versions because that’s because MP3 is often too compressed with no significant difference between soft and loud volumes. When you increase the ratio up to a point where there’s no difference between the soft and loud parts of the audio signal, the make-up gain kicks powerfully to compensate for the volume alteration. As a result, the song has no dynamic range and it stays the same volume whether at the softer parts of the signal or the louder parts. What’s the difference between a limiter and a compressor? A limiter is a compression device, while not all compression pedal boards are limiters. This is an important thing to know about when you’re looking for the best compressor pedal. The only aspect that differentiates a limiter to a compressor pedal is how much ratio signal of a device influences the workings of the guitar. For example, a high ratio of a compression device is 20:1 all the way n:1 (n means infinity). This means once the audio signal reaches 20 dB above the threshold, it compressed the signal without suppressing the guitar tube amps completely. For example, Keeley compression devices offer full compression settings as well as attack, release, and sustain adjustments. This is what most limiters lack. When is the best time to use a compressor pedal? This is when the compressor pedal is on all the time. So, the main purpose is that whatever sound you’re producing, the pedal is influencing the audio signal and tones. This is a good way to use a compressor pedal, especially when you want a more even, balanced, and thicker sound. You can crank up the compressor to a more gentler level and then increase it based on your preferences. But do not compress the tones to a higher degree as that interferes with the dynamic range and reverb pedal settings of the final music. A compressor pedal is best for producing clean sounds as it balances out loud parts of the audio signal. Guitarists performing live can use this device to compress the audio signals down to a cleaner tone to combine the music better with other musical instruments such as with Xotic effects. When you use compression for clean sounds, you can switch the device off when you decide to switch to drive sound. Drive sound has a knack of compressing the tunes, it its own unique ways, so you wouldn’t need a compression pedal for that. If you have an SP compressor, using it this way would result in a more dynamic range of sound. This is a new and unique way to approach guitar compressor pedals. A best guitar compressor pedal can be used to produce an effect in the overall music. The skill is to find the right time to switch the compressor pedal on when you want to add an “effect” or striking tone to your music and then switch it back off. There are many different ways to use a compressor pedal for the best tones. And the only way to master the art is to experiment with the compressor pedal for cleaner and drive sounds, all the time. 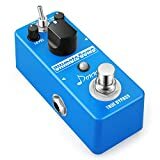 When not to use a compressor pedal? To know when to use guitar compressor pedals includes knowing when not to use it. So, when you’re buying the best compressor pedal on the market, you must think hard about when you shouldn’t use it. It is possible to produce good music without compression. For example, if you like to indulge in soft fingerpicking sequences during the composition of a song, you’d prefer increasing the intensity of your fingerpicking as the song progresses. So, the final result would start off at a lower volume toward deeper tones. All this without the use of compression can result in a better dynamic tone. However, if you do the same with the guitar pedal compressor on, it is possible that the tone won’t sound natural. Especially when the volume gets higher. You won’t be able to differentiate between your fingerpicking tones from lower to higher volumes because with a compressor the full effect will be too even to take notice. It’s important to consider the presence and lack of compression in your music. Even the best guitar compressors offer features that could make or break your music. Keeley compressor series, for example, offer incredible chord attack impacts which can increase sustain and ultimately affect the tonal range of your music. Of course, with compression pedal, you can achieve a greater dynamic tone and incorporate versatile tones and effects. But, uncompressed audio signals can sound better given you know how to tweak what works for you. We like what the MXR M102 Dyna Comp has to offer to its users. Being an exact performance replica of Keeley, it’s one of the best compressor pedals on the market. The Dyna Comp is compact powerhouse with incredible tonal, volume, and frequency controls. And it has a good track record for durability and makes a good competitor as a dynamic guitar effect pedal. There’s a lot you can achieve and create with this best compressor for guitarl. That said, it’s still the best choice if you’re unwilling to spend an exorbitant amount on compression pedals.